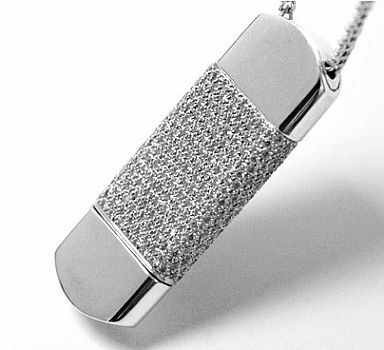 For the super-rich tycoons who need to carry useful business data all the time, Mii Stor has created a 4GB flash drive made from diamonds and white gold to pack your million dollar data in equally luxurious style. The Snow drive is a Sandisk 4GB drive encased in 18ct white gold studded with 96 white diamonds totalling 1.44ct. And, with the white gold chain, the precious little thing can be worn round your neck too. So, another chance to show off your wealth in an elegant yet geeky manner. The shiny flash drive retails for around $19,000. But, if more storage capacity is what you are looking for then leave the bling thing and get yourself the Buslink Pro 2 flash drive from CDW that is though not made of gold or platinum but it packs 64GB of data in it.